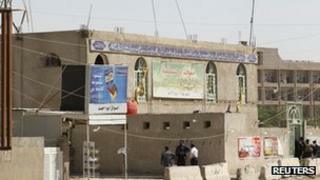 At least 31 people have been killed in a double suicide bomb attack at a Shia mosque in the Iraqi capital, Baghdad. Two bombers blew themselves up inside the mosque in the eastern al-Qahira district. Close to 60 people were also wounded in the attack, officials say. The attack comes a day after bombings near Baghdad killed at least 10. There has been a surge in sectarian attacks in recent months on targets like mosques, restaurants and local markets. The two suicide bombers shot dead the guards standing outside the Habib ibn Mathaher mosque shortly after midday prayers, and then blew themselves up inside the mosque, eyewitnesses said. The violence has rekindled fears the country is being dragged towards a wider conflict between the Shia majority and the Sunni minority. "The suicide bomber detonated himself among the worshippers, who were gathering after the call to prayer," policeman Furat Faleh, who was near the site of the blast, was quoted as saying by Reuters news agency. Tuesday's attack comes a day after bombings near Baghdad killed at least 10 people in the cities of Taji and Fallujah, and included a blast in a roadside restaurant. And two days ago, a string of bombings struck cities in southern, central and northern Iraq, but fewer people were killed in those attacks than in Tuesday's attack on the mosque, says the BBC's Rami Ruhayem in Baghdad. Last month was the bloodiest in Iraq since June 2008, with 1,045 civilians and security officials killed. Sunnis have accused the government of Prime Minister Nouri al-Maliki of discriminating against them - a claim the government denies.